The first night will be charged and it is no-refundable.If cancelled or modified later to 21 days before the arrival or in case of no-show there will be a 40% fee of the total cost. Hotel will charge the first night for deposit by credit card.This amount is not refundable. If cancelled or modified later to 21 days before your arrival or in case of no-show a 40% fee of your total cost will be charged. 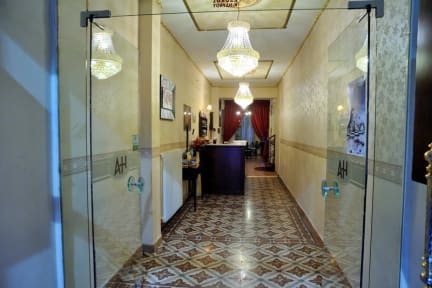 Enjoy the welcoming atmosphere of this small and familiar hotel. Atlantis hotel is situated in the historical centre of Thessaloniki just some minutes far from the Railway Station, Aristotelous Square, Ladadika, White Tower, Rotonda, University, Ancient Agora, Museums and Churches. In the surrounding streets you will find a huge number of bars, restaurants, supermarkets, bank, post office. We have a bus stop just outside from our door so you can go for swimming or visit IKEA, Magic Park and other big malls in the city. Atlantis hotel is housed at a historical building recently renovated and has 25 beautifully decorated and elegant rooms. All the rooms have private bathroom, A/C,TV, free internet access, direct telephone line, hairdryer. 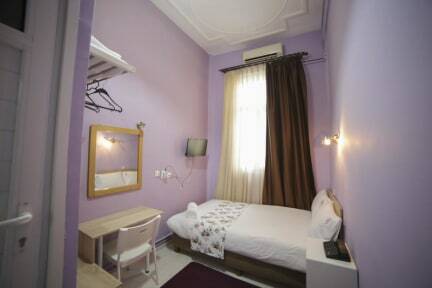 Deluxe Rooms with private bathrooms also have fridge,and safety box. Our rooms are friendly, ideal for solo travellers and small groups. We try our best to make all the travellers and backpackers to feel like home and give them the chance to taste the real Thessaloniki. Our experience and hospitable personnel will gladly serve you and provide you with all the information you may need. The hotel offers 24 hour front desk, wake-up calls reservations for cars, fax service, safety box at the reception. Please contact us if you have any special requests e.g. to rent a car for you or to buy tickets for a special event. We wait to welcome you for your holiday or business stay. We can arrange parking for your car. It costs 10 euro per day. across the train station, cozy, clean and friendly staff.